These fillets are flash frozen on board the boats four hours after the catch. This ensures the fish are as fresh as they can be when you are ready to cook them! Arrange Halibut evenly in a casserole dish. Pour in chicken broth, sprinkle fish with parsley and tarragon. Bake in preheated oven for 10 minutes and throw out excess liquid. In a bowl, fold grated cheese into beaten egg white. Spread cheese mixture over Halibut pieces. Put in broiler until golden brown. for 15 minutes in cold water. 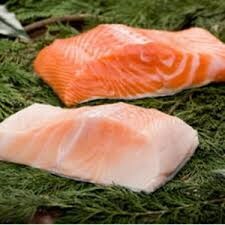 Make seasoned oil and rub all over thawed Salmon. Grill on medium heat for 6 minutes, turn and grill 6 minutes more, or to desired doneness.